I adore getting new things for my kitchen. Recently, I have acquired two new additions. One is a set of awesome oven mitts. My old ones were wearing thin and in fact, one had a hole in it. I had to be careful not to burn myself when using them. Anyone that knows me knows I can be a little careless and accident-prone so this was a real concern. My new oven mitts are sturdy and also really pretty. 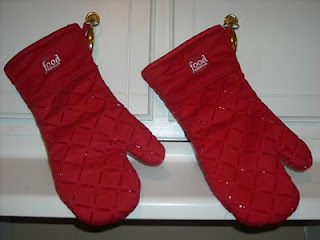 As a side note, we plan to paint the kitchen walls red soon, so the mitts will match nicely. My second new addition is a new skillet. With a family of six, our old 10 inch skillet was just not cutting it anymore. I knew we would have to get a bigger one eventually, but when I made supper the other night, I realized the time was here. I had made a shrimp and mushroom linguine, but I doubled the recipe to feed our crew. 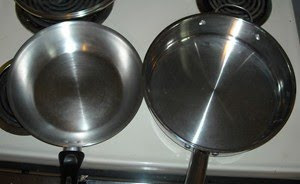 Rather than risk it bubbling over, I had to pull out another skillet and divide the food into each to finish cooking. 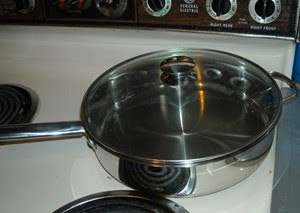 Of course, that meant another pan to wash and since I'm not big on doing dishes........ Anyway, here is a pic of our new monster skillet. It's actually an 11 inch chicken fryer, but it will do the job nicely! See how big it is compared to the 10 inch on the right? I don't care if it makes me weird, I love my new skillet!